Can you draw an imagination of commotion state between Human-Mind and Mechanical-Mind? Probably not. What if Mechanical-Minds become stealer of human employment? What if technological advancements takeover labour force in times ahead? Well, working as tech-professional, it’s quite natural to think about above questions. Living on earth of continuous technological upgradation and witnessing the prevailing changes in the workspace, the boon of machines sometimes acts as a worst nightmare. 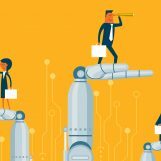 With the influx of automation, the vertical industry sketches in myriad changes. From FMCG to BPOs, Healthcare to Logistics, Agriculture to Automotive, each sector is undergoing a roller-coaster ride of high-tech elevations. These industries are investing a huge sum of amount in automating regular, constant and prosaic projects. According to Capgemini Research Institute study, India stands at 5th position in adapting to automated technologies at extent. This monstrous adoption of automation across the industry can lead the businesses attaining around $165 billion in cost savings in the next four years. For example- The transportation network company Uber, made a beer run using self-driving truck which traveled around 200 kilometers from Fort Collins to Colorado Springs just to deliver a cargo of Budweiser. A person was present in the truck just monitoring the automated system. So this velocity of hi-tech advancement marks the end of the human workforce? According to a Gartner report, around 1.8 million jobs will be lost by 2020, though 2.3 million new jobs will also be generated by then. As per revelation, AI-concerned job generation will witness a positive graph, at the heights of 2 million net new jobs from 2020 to 2025. This revelation depicts that despite loss of direct employment due to automation, a set of new-collar jobs will be created in near future. What will be the eligibility criteria to penetrate into a new set of jobs? What is the secret sauce to survive in the industry? The explanation to this dilemma is – Workforce Modernization. The perspective of organisations is changing and they want their professionals to work in a more efficient and advanced manner. The essence of this concept is forthright- Modernization of labour force is an undergoing process of using technology to provide best of the services in every sector. • Reportedly, technological modules including AI and ML have not been united with higher education which created massive skill gap among graduates. Element AI’s research unveils that only about 90,000 people globally have appropriate skill to catch up with AI/ML requirements. • There is a need to train next-gen employees/employers for forthcoming challenges and educational institutes should outline the academic curriculums with a focus on upgraded technologies. • Additionally, computer science graduates are required to dig till the roots of programming languages and businesses and also throwing light on the skills needed for recruitment. • According to ZipRecruiter study, tech companies are broadening their minds to hire those who may not have a bachelor’s degree but have required set of skills to commit to the job. • Even India is experiencing the same transformation, the institutions and companies have started introducing the futuristic culture of improving skills through required training modules. • With the help of online learning platforms that offer specialized courses and nanodegrees for updating your skills, youth is paving its way towards bright, trained and skilled future. It is not necessary that technologies including AI/ML, Blockchain and others should replace the human workforce to build developed future. These can be used in amplifying human abilities rather than replacing them. With the advancement of technology, the reconfiguration of activities like – creative and agile work will be done and focusing more on replacing schedules of blue- and white-collar jobs. This will help in generating modern, optimized and creative workforce of the future. What do futuristic pockets hold for us? • Embracement of technology and workplace. • Although a new set of jobs are best for future yet evolutions such as professing emotional intelligence the ability to adapt, intellectual curiosity, and problem-solving skills are indeed required for humans. • We will also observe machines and minds communicating and working hand in hand. • An intelligent workplace will evolve with a capable workforce that can lead better and yield more opportune results in future. The evolution in the workforce will undoubtedly nurture and flourish the era of new age of technologies with the introduction of fourth industrial revolution or Industry 4.0.